I recently read an account of the importance of Mary's title, Theotokos, in a book called Steward of the Mysteries, by Bishop Nicholas Samra of the Melkite Church. He pointed out that in Eastern iconography, as a rule, Mary is portrayed with her Son. Her importance is in relation to Him. Just as she gave flesh to Christ, we are called to give flesh to the mystical body of Christ, the Church, when we go out into the world. Mary's title Theotokos, used in the Council of Ephesus which was convened in 431AD is translated very often as God-bearer or alternatively as Mother of God. She was both, but this word means something distinct, I have been told - one who 'bore and gave birth to God'. Any saint might be referred to as a God-bearer too, theophorus. Each of us is called to bear God in a spiritual, moral and virtuous sense, and by this, our flesh is informed and transformed by Christ. Mary is a theophorus too, but only she is Theotokos. She bore God in a physical sense too and gave birth to Him and her flesh formed Christ's. As we reflect on this, one might think that some images do not conform to this tradition. Many of these are wonderful paintings. One of my favorites is Sassoferrato's Virgin at Prayer. I have reflected on this and am inclined to think that as far as possible we should follow the East in this and should consider a painting of Our Lady without some indication of her relationship to her Son to be unworthy of veneration. Two conditions were cited by Theodore the Studite as necessary for an image to be considered a Holy Image worthy of veneration (and appropriate for the liturgy). The first is that it should bear the essential characteristics of the person and the second is that it should bear the name. This painting, at first sight, has neither. Essential to Mary is her relationship to Christ as Theotokos and this, therefore, ought to be portrayed. However, all is not lost for Sassoferrato. First of all, there are, at first sight, some exceptions to this rule even in Eastern iconography. These might be portrayals of her prior to the birth of Christ, such as the festal icons of Annunciation and the Presentation of the Theotokos to the Temple. However, these narrative icons place Our Lady in relation to Our Lord by setting her in the context of Salvation history. Also in the Eastern Church, these will be set in the second tier of images. The saints are in the lowest, the festal scenes in the second and then as we get higher, eschatological themes. 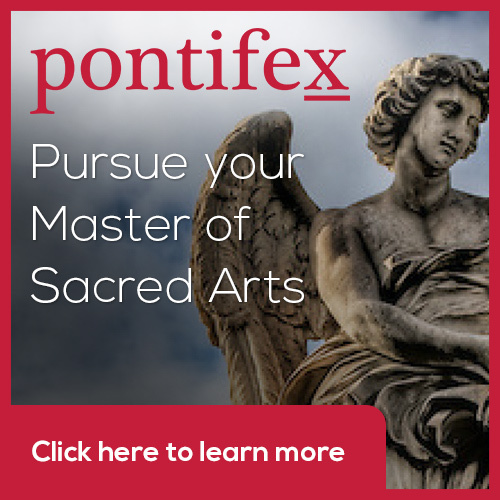 All images in the church ought to be placed so as to highlight the relation of the person or scene to the center of our faith - the person of Christ, whether it is by being in relation to an icon of Him, or to the altar. When these icons are removed from their liturgical context, say for our icon corner or for a procession, this visual setting should be in our memories so that it supports through a visual language what we know intellectually regarding the truths portrayed in the image itself. 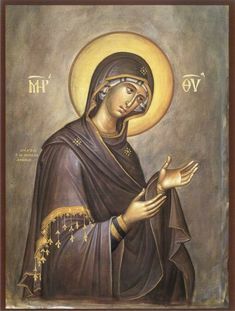 A third icon is a depiction with her hands in supplication - Theotokos Agiosortissa. However, this icon, as we can see, is not self-sufficient, but needs to be placed in relation to another, which is of Christ, so that she is addressing her son. As a person, it is an essential aspect of each of us that we are in relation to others, and it is through our relationships that we understand ourselves. We understand ourselves most profoundly through our relationship with Christ - as John Paul II said: 'Christ reveals man to himself.' This being so, it follows that Christ also reveals all others to each of us, that is all saints and for that matter, everyone around us is understood best in their relationship to Christ, to the degree that it is apparent to us. This is why in regard to sacred images, each saint ought, in some way be in obvious relationship to the central icon or icons of Christ. In regard to Mary in particular, I think that in this age of dualism in which the popular philosophies of the day swing from one extreme of spiritualism to materialism, that a clear indication of both the divinity and the humanity of Christ is necessary, and it is through Our Lady, the Theotokos and ever-Virgin Mary that we emphasize His humanity, without diminishing his divinity. So, I am advocating a hardening of this rule for art today as an antidote. If we wish to redeem the Virgin at Prayer, we could add her name to the frame, and we could place it in relation to an authentic painting of Christ in such as way that we perceive that it is connected to him spacially, and this symbolizes for us the personal relationship. 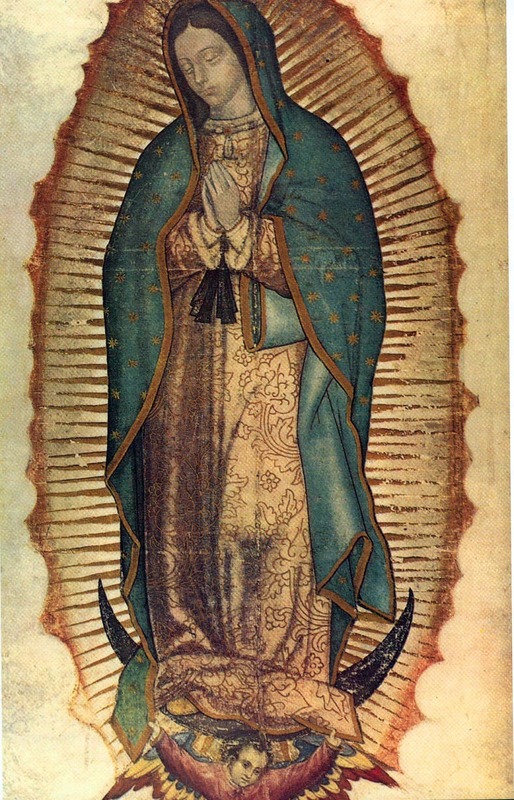 We might wonder, incidentally, if the image of Our Lady of Guadalupe runs against this tradition too. If so, one ought to, perhaps, reconsider asserting this guideline so strongly. After all, the creator of this image is divine! I would say that in fact, we need not worry, for this conforms to the rule because she is portrayed as a pregnant. We know this because the ribbon around her waist is a traditional Aztec sign of pregnancy. And, because the mandorla around her is a Christian sign of the presence of Christ, in this case within her. The only way to undermine this argument, I suggest, is to maintain that a baby in the womb is not yet a person and we know where that leads...So, next time you go on the March for Life, carry an icon of Our Lady of Guadalupe! Older PostBearing the "Good Fruit"